A round played at Hidden Cove is truly a day away from the ordinary. 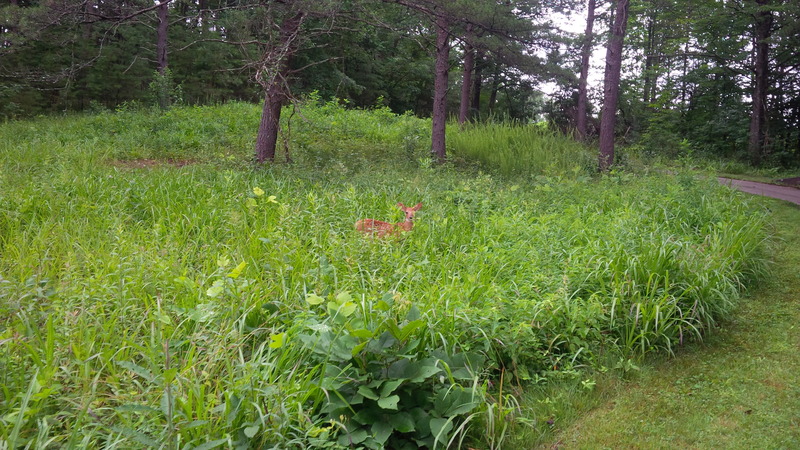 Playing golf at Hidden Cove Golf Course at Grayson Lake State Park feels like one is trespassing against Mother Nature. The 2004 Brian T. Ault design, set in the remote Appalachian foothills of Carter County, Kentucky, is a beautiful tract so far from the hustle and bother of everyday life that it could easily pass for an extension of the Grayson Lake Wildlife Management Area. The visual aesthetic at Hidden Cove is fantastic, as the course was carved from the forests on a great piece of property in the rolling terrain lying above Grayson Lake. 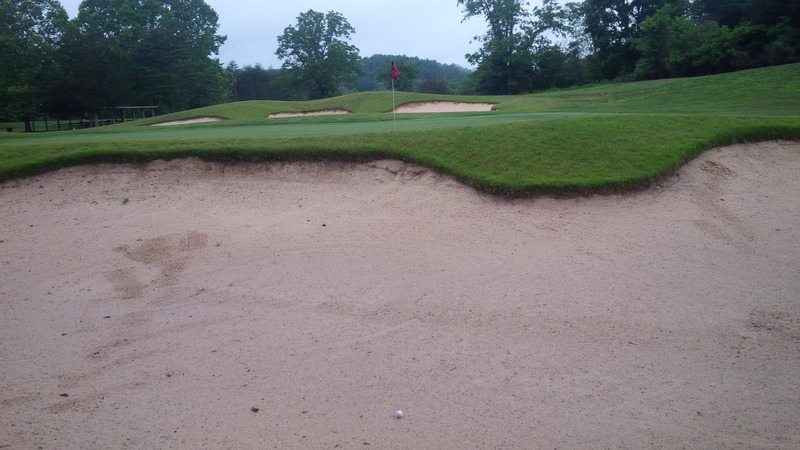 The 60 bunkers at Hidden Cove had impressively clean sand, with which I became acquainted on the 1st hole. Though the course is in the hill country, Hidden Cove certainly isn’t strictly a mountain golf course. With only a few exceptions, the change in elevation from tee to green is less dramatic than it is strategic and in keeping with the rolling nature of the terrain. 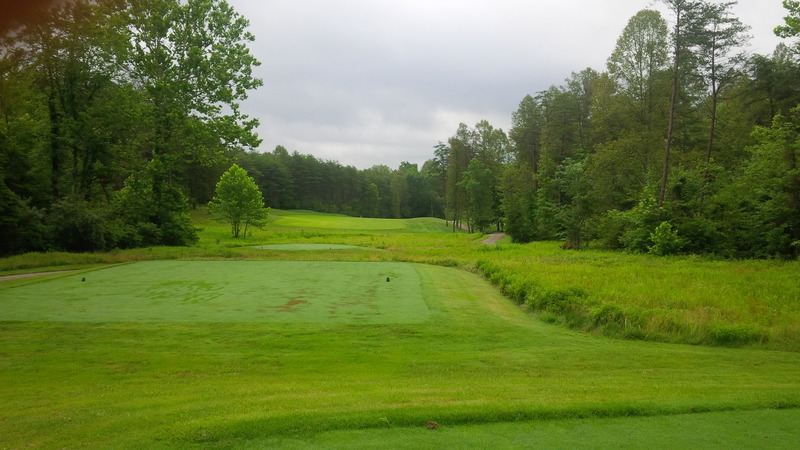 As an early 2000’s addition to the Kentucky State Parks golf portfolio, Hidden Cove offers a true championship caliber golf course, in keeping with the other Kentucky State Park golf courses built or redesigned around that time. 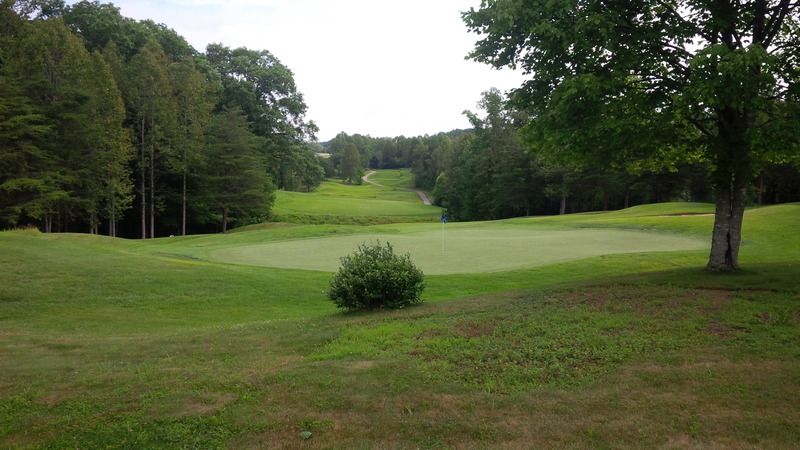 From the tips, the course plays to 7,155 yards, with a course rating and slope of 73.1/135. 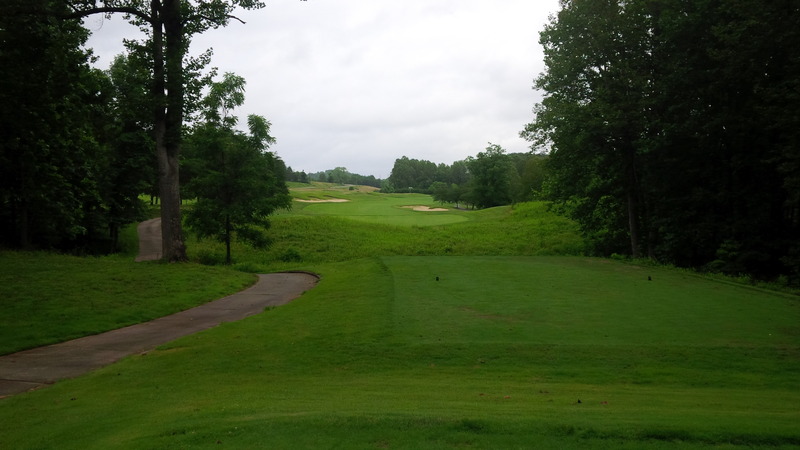 From the regular tees, it plays to a kinder, gentler 70.5/129 course rating and slope at just under 6,500 yards. The gentle dogleg of the gorgeous 2nd fairway gives the player a choice of going over or around the forest. The nearly 700 yard difference between tees #1 and #2 presents two vastly different golf experiences that accommodates the hacker while still challenging the better player, thanks in large part to the strategically placed bunkers. And by bunkers, I mean 60 bunkers on a course that is already relatively narrow due to a majority of its holes being carved from the dense forest woodlands. Navigating Hidden Cove’s layout is an exercise in traversing the course without giving in to its deceptive subtleties. That is to say that one is rarely faced with that “Wow!” hazard that requires a go-for-broke miracle shot. Instead, good scoring at Hidden Cove, at least from the regular (#2) tees can be accomplished with a patient and conservative approach to the course’s narrow landing areas, gentle doglegs, avoiding the aforementioned bunkers, and playing to the correct portion of the rather large greens. 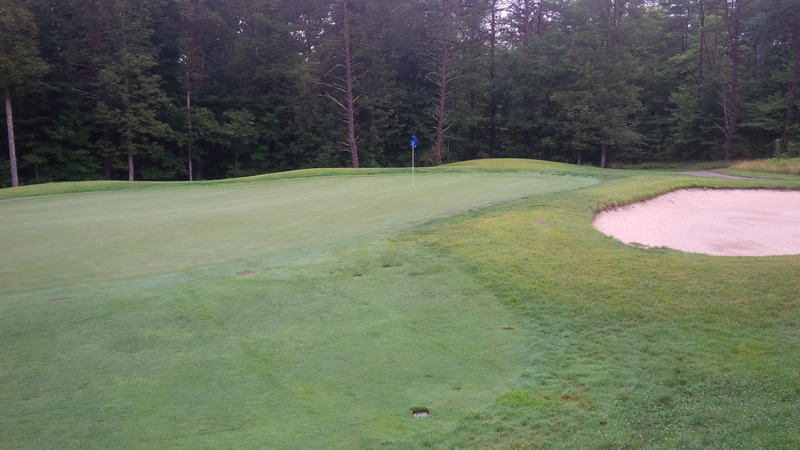 I was utterly impressed with the quality of Hidden Cove’s greens, like the 3rd green pictured here. 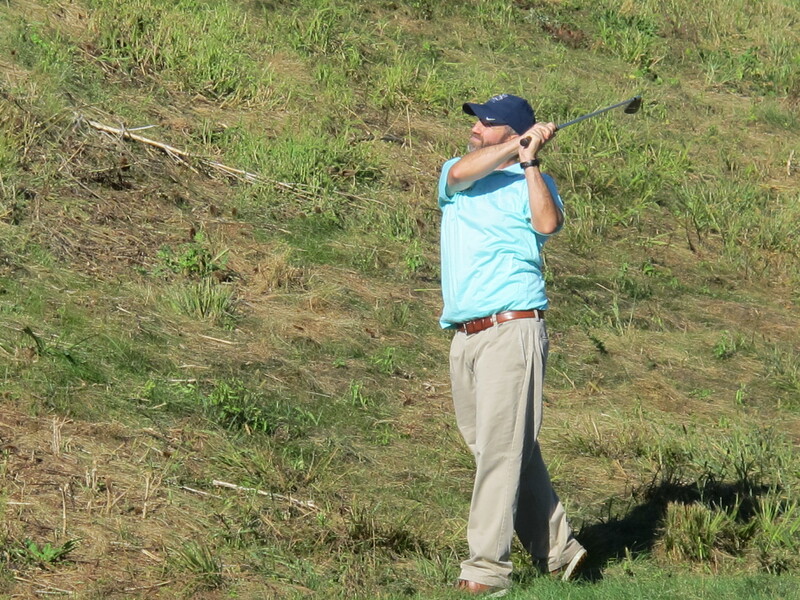 To be sure, there are plenty of birdies or better available for the aggressive big-hitter. 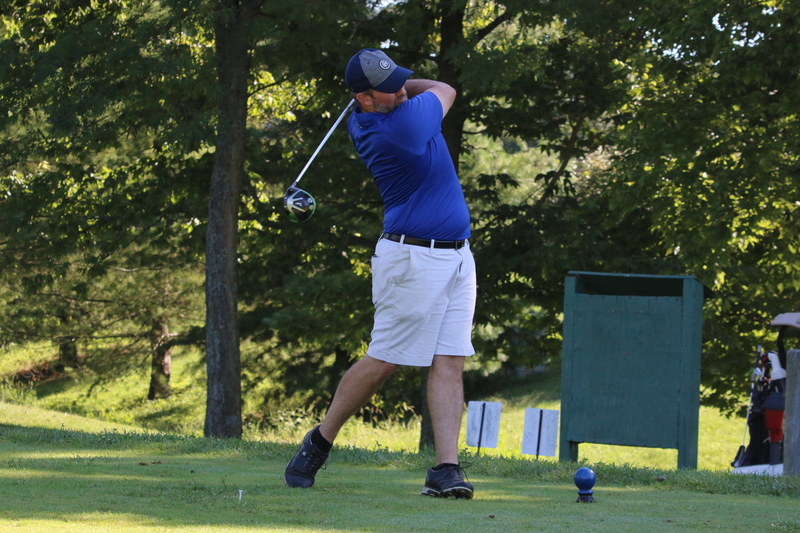 If one insists on pulling driver every tee box and executes the shot flawlessly, there is rarely more than a wedge or short-iron required to reach the green. 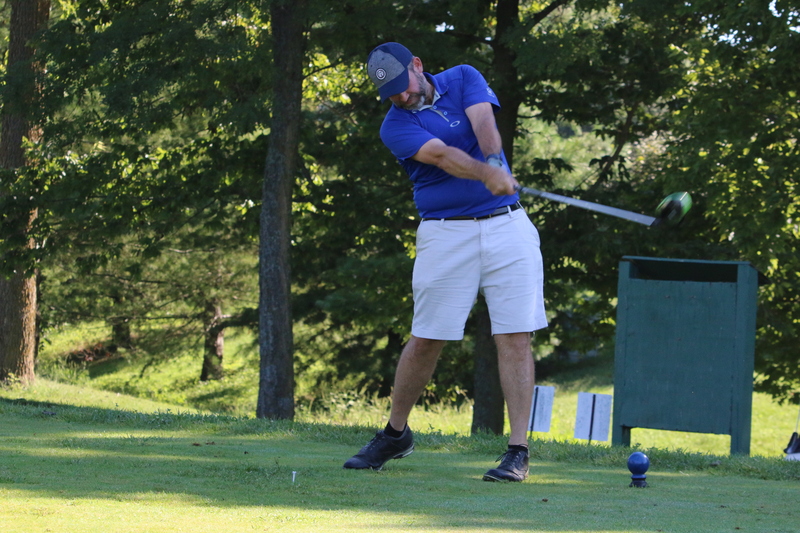 However, failure to play the drive on the correct vector usually results in at least a half shot penalty, be it in the woods, a bunker, or at an awkward angle to the large part of the green. That the course allows several options from the tee and isn’t a grip-it-and-rip-it bomber’s paradise gives it a sort of old-school feel, despite its relative youth. I’m sure this was part of Grayson Lake State Park’s resort mandate to Ault, but I think it’s a resplendent modern take on classic golf architecture. Sure, that’s just one tree up there on the hill to the right, but for someone who draws (or hooks) his driver, it presents a real challenge to start a long, uphill hole. The front nine winds a little further from the clubhouse, giving it a more secluded feel. While full of solid, above average holes, the par five 3rd and 5th holes were the stars of this side. The 3rd hole requires a hard fade off of the tee if one wants to get home in two shots, or else the drive will end up in a massive bunker or run through the fairway. Another enormous fairway bunker occupies most of the right side of the fairway between 200 and 150 yards from the green, forcing the shorter hitter to decide whether to lay back to an uncomfortable yardage or challenge the massive beach. Of course, the green is well protected with additional bunkers to its front, left, and back right for good measure. The long, uphill 5th hole is simply a beautiful golf hole visually. A giant mound with a lone tree upon it pinches in the beginning of the fairway, making the hole appear like a long, narrow, green ribbon leading up to a green at the end of a tunnel. The 6th hole’s tee shot offers a subtle risk/reward opportunity: lay back to the left for a good angle to the green, or cut the corner down the right side for a short wedge to the pin. In reality, there is a generous landing area for well struck drives, with the only real trouble being the three large bunkers inside 150 yards protecting against laying up too closely or clumsily. The big two-tiered green at the top of the hill is gently sloped toward the fairway, giving even just decently struck shots a chance to come to rest in the vicinity of the flag. After a quick stop through the simple, government quality clubhouse at the turn, the course progresses from wooded corridors to a slightly different feel on the back nine. The first three holes alternate between the scoring opportunity of the short 10th hole, the long downhill par 3 11th hole, and the gently left-bending par five 12th hole. From there, the course’s second personality takes root. There’s no other way to put it, the 16th hole at Hidden Cove is a brute, especially under conditions that prevent any rollout in the fairway. The dense woodlands give way to more open, trajectory-driven golf on the brilliant short par four 13th and 14th holes. After a visit to the peacefully secluded 15th, with its resident deer population happy to greet the discreet golfer, Hidden Cove’s routing heads for the homestretch where the course really shows its teeth. The most famous, or infamous, hole at Hidden Cove is the “Tiger Proofed” number 16; a par 5 that stretches to 647 yards from the tips, and a formidable 583 from the regular tees. 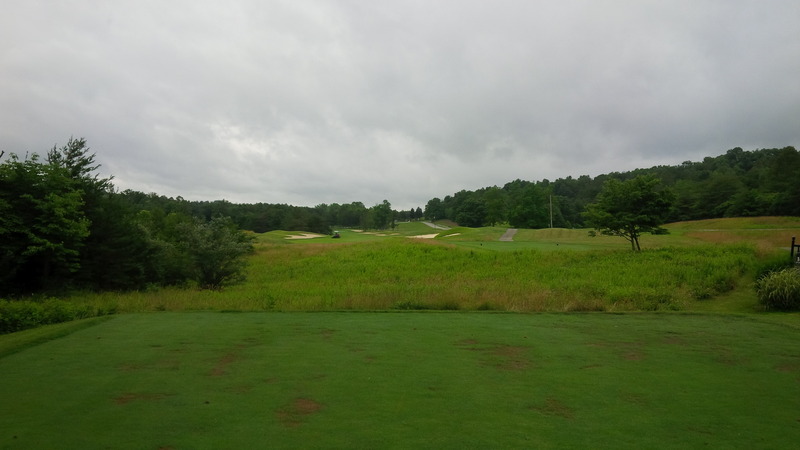 As light rain began falling on an already wet, no-roll given golf course, navigating 16’s extreme length and five fairway bunkers proved a tough task. This hole is perhaps the most wide open and devoid of a tree corridor of any on the course, subjecting golf shots to more wind than perhaps any other hole. The penultimate 17th is just a marvelous golf hole, with a demanding tee shot towards a gentle dogleg right, with an approach to a well protected, sprawling green complex. The par four 17th was one of my favorites at Hidden Cove. Bunkers on both sides of the fairway in the driver landing area force a decision from the tee. Laying back from the bunkers results in an extremely long approach at a bad angle, especially if you hug the right side, as the trees forming the dogleg will make it a blind shot. Challenging the bunkers unsuccessfully results in an approach from the sand from an awkward angle. Really, any drive not on the left side of the fairway is going to produce a tough approach shot. Finally, the Hidden Cove’s closing 18th hole is a tough challenge on the first time around the course. 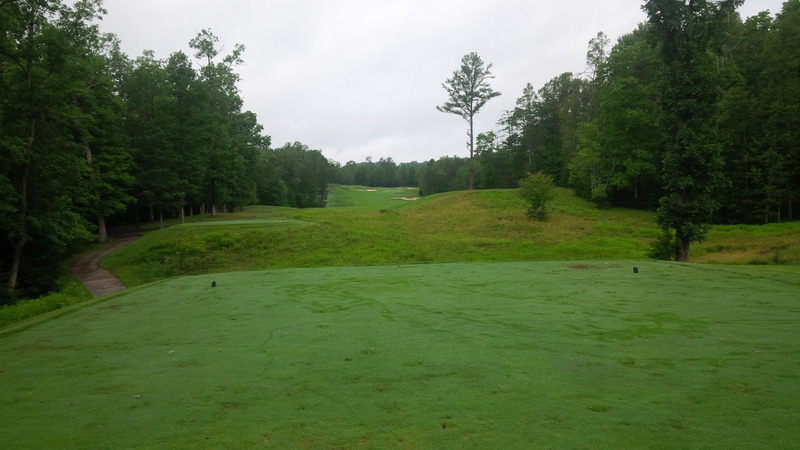 From the regular tees, a 250 yard drive will run through the fairway into a shallow ravine hazard. A look back at the 18th hole from behind the green at Hidden Cove. From the fairway, it’s a short iron up the hill to the elevated green that slopes severely from back to front. 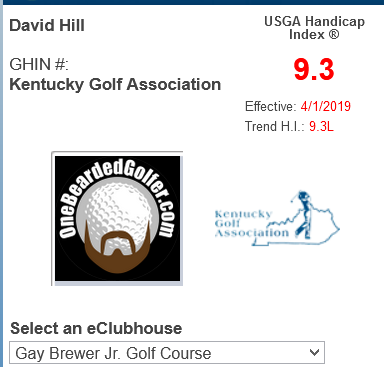 It’s not the most difficult closing stretch of holes on the Kentucky Golf Trail, but it’s a fitting finish to a really nice, solid golf course. Part of what makes Hidden Cove noteworthy and worth the journey from civilization is the course’s conditioning. 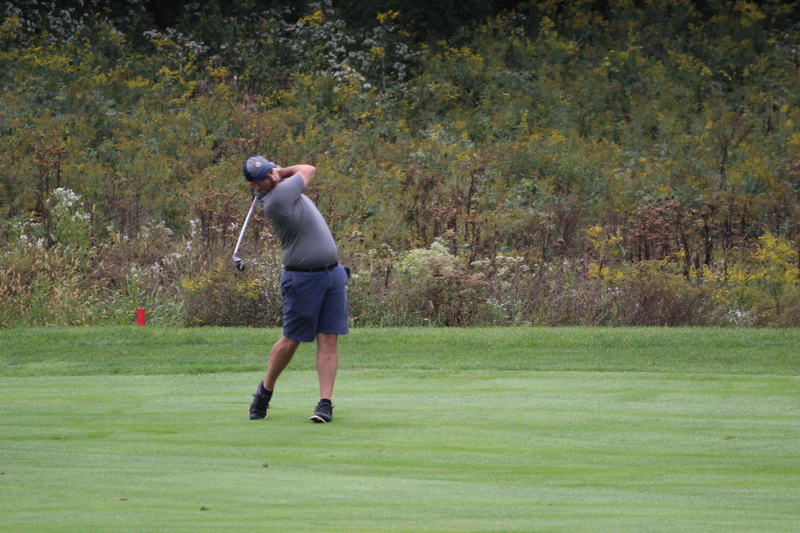 The Bentgrass fairways and greens were all lush and full of color, which should be expected given the abundance of water available from Grayson Lake. Several of the tees looked as if they’d been victimized by the aftereffects of our brutal winter and incredibly wet spring. However, the damage was under control, and I never had to tee a ball up on anything other than grass. Just off of 15 green, a gentle reminder that guests at Hidden Cove are just that: guests. 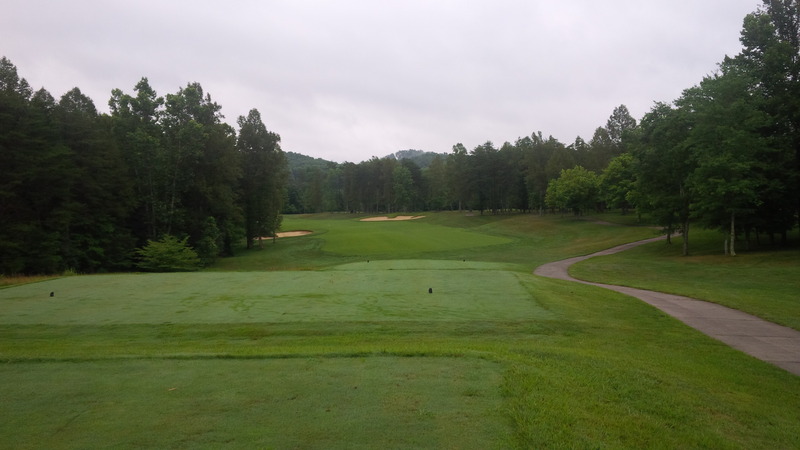 Like most of the other Kentucky State Park courses I’ve played in the last few years, weeds, sedge, and nutgrass were present, if not abundant, in the rough grasses, so I suspect that is the result of a conscious decision to cut back on the chemical budgets. Fortunately, the turf grasses have held strong so that the weeds really don’t affect play. After such a thoroughly enjoyable initial experience, I’ve put Hidden Cove on my biannual rotation of day-trip destinations, along with StoneCrest, Eagle Ridge, Wasioto Winds, and My Old Kentucky Home as must play courses. ← Lasers, Apps, Books and Sprinkler Heads – February Poll Question: How do you get your yardages? 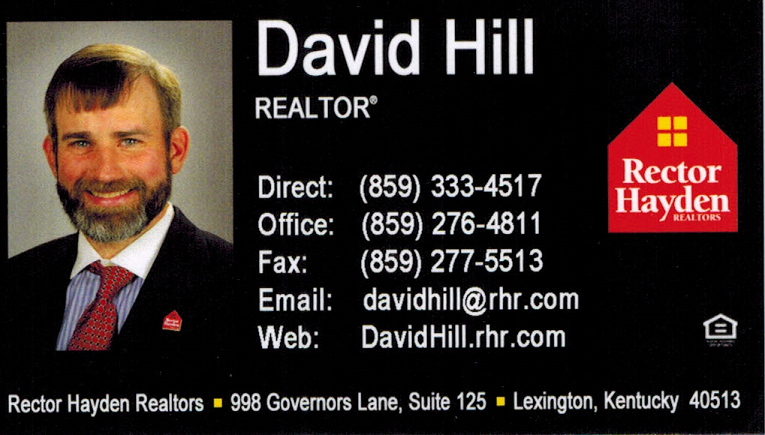 Looks like a good stop on the way to Louisville or Lexington from points east! Absolutely, though it is a good half hour of windy roads from the Interstate.